If you are interested in a bigger vacation or long road trip, escape the DC humidity and check out the golden state’s best beaches. Located far south in the state, just outside of San Diego, Coronado Island is a small town where biking and walking are the norm. Home to the historic Hotel del Coronado, this beach can get busy in the summer, but its depth leaves plenty of space for families to relax. The north end of the beach allows dogs, so you can take a walk down the shore and enjoy playful pups. With great restaurants, shops, and positioned in proximity to the world-renowned San Diego Zoo, Coronado Island is a popular vacation destination for a reason. Laguna Beach is roughly 80 miles north of Coronado Island, nestled between San Clemente and Newport Beach, Laguna is popular for its beautiful beaches, canyons, and art scene. Pageant of the Masters, an incredible and jaw-dropping even in which live actors recreate famous paintings, draws many visitors to the area. Home to the luxurious Pacific Palisades and located along the coast between Malibu and Marina del Rey. Santa Monica is a blend of beach charm and modern living. 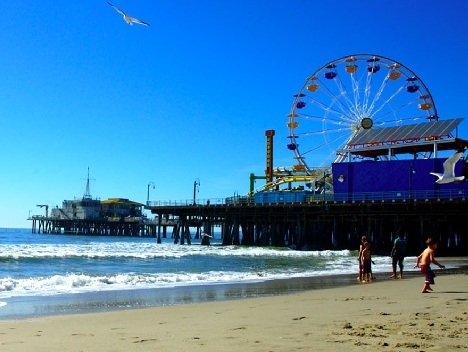 Santa Monica Beach is downright beautiful, attracting celebrities and chock full of restaurants, shops, and outdoor attractions. 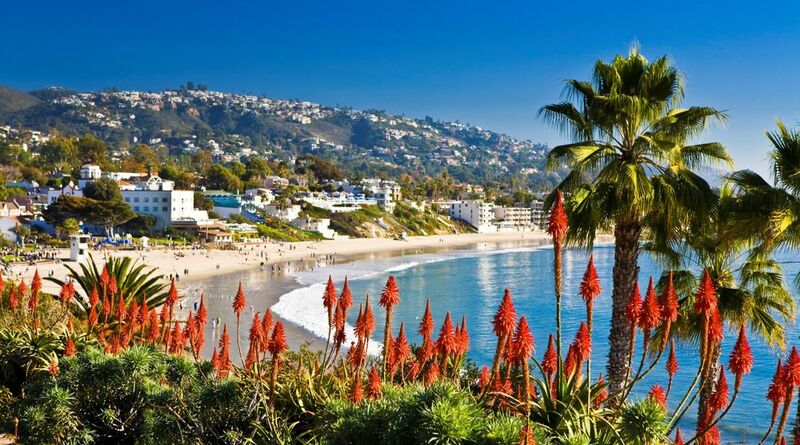 About 90 miles up the California Coast lies Santa Barbara. Home to beautiful beaches where surfing, sailing, and whale watching are prevalent, Santa Barbara is an excellent family destination. Popular attractions include the historic Mission Santa Barbara landmark and The Presidio of Santa Barbara –both paying tribute to its Spanish history and influences. If you’re looking for a less beachy experience, go north to San Francisco! Home to Alcatraz, The Golden Gate Bridge, and Fisherman’s Wharf, San Francisco’s tourist attractions are worth exploring. Another area farther north definitely worth exploring is the quaint town of Carmel. Carmel is a seaside town just south of San Francisco. With its gorgeous beaches Pebble Beach Golf Course, small town charm, and emphasis on the outdoors, Carmel will be unlike anywhere you have visited before. Known primarily for its huge celebration of Mardi Gras in February, New Orleans has a some of the most unique and popular nightlife in America. Located in southeastern Louisiana on the Mississippi river, New Orleans has always been a popular vacation spot. New Orleans is known for its vibrant nightlife, and even beyond Mardi Gras, it remains an exciting place to explore and visit. Throughout the 24th and 26th of April and then again on the 30th to May 3rd, the annual New Orleans Jazz and Heritage Festival presented by Shell takes place. Often called “Jazz Fest”, the New Orleans Jazz and Heritage Festival is a celebration of the music and culture from the area where one can see musicians ranging from John Legend to Ed Sheeran to Elton John to local New Orleans performers. Started in April 1970, the first festival featured Mahalia Jackson, Duke Ellington, Al Hirt, and many others. The festival has only grown from its initial audience of 350 people to 435,000 in 2014. Truly a legacy of New Orleans, it is exciting to see the development of the festival for this year where the turnout is expected to be even greater. Food, crafts, and other arts are also central to this celebration. There is Cajun and Creole food abound as well as other traditional New Orleans dishes. Some of the most popular places to eat include Café du Monde, located right on the water and famous for its beignets, Lafitte’s Blacksmith Shop, considered the oldest bar in the United States, and Three Muses, a jazz bar located on Frenchman Street. Beyond restaurants, are the two cooking stages at the festival that make classic New Orleans dishes and offer samples of these dishes, which exhibit unique recipes and local produce from esteemed chefs. There are also marketplaces full of ancient and modern crafts alike that truly display the culture of New Orleans. The New Orleans Jazz and Heritage Festival is a unique legacy that draws all types of people and really celebrates the culture of New Orleans. By visiting New Orleans, it will continue to promote the culture in this region and encourage others to travel there as well. Please visit www.nojazzfest.com for more information on the Annual New Orleans Jazz and Heritage Festival. Less than a two hour drive from DC, Richmond, VA is known for its historical significance and beautiful suburban landscape. Home to a number of battlefields and museums from the American Civil War, Richmond has maintained a number of pre-reconstruction buildings that emphasize the neo-classical architecture of the 1700s. With the Virginia Museum of Fine Arts, the Edgar Allen Poe Museum, and the Virginia Center of Architecture within a few miles of each other, Richmond is a great destination for a weekend spring getaway. Richmond is a Spring lover’s paradise with numerous outdoor activites to enjoy. Maymont is a 100-acre Gilded Age estate that was the former home of millionaire couple James and Sallie Dooley,and today, it is one of Richmond’s most cherished historic symbols. Celebrating the area’s perfect combination of man-made architecture and pristine parkland and gardens, Maymont is a must-see part of any Richmond visit. The estate offers a wide variety of weekly programs and annual events including guided tours of the mansion. Donations are requested for visits to the grounds, gardens and mansion. A small fee is charged at the Nature Center. With more than 900 restaurants to chose from, Richmond, VA boasts an eclectic variety of cuisines. From nationally recognized five-star restaurants to a number of beloved local eateries, the typical Richmond resident is no stranger to a hearty meal. Whether you visit The Roosevelt on N. 25th Street for a unique Southern experience, the Lemaire on West Franklin for an opulent Parisian feast, or Amour Wine Bistro on West Carey Street for exclusive prix fixe menus featuring expert wine pairings, the restaurants of Richmond will keep your tastebuds entertained. Richmond’s wine culture is one of a kind. The region offers several shops and restaurants specializing in local wines and boasts exclusive wine tasting events. If you’re in the mood for a relaxing wine adventure, visit the James River Cellars Winery. Just 15 miles north of Richmond, this acclaimed winery offers premier wines from Virginia-grown grapes. Visitors can enjoy picnics on the patio or the scenic hilltop view while sipping award-winning red and white wines. Steeped in rich nautical heritage, Annapolis is a contemporary city built on the soil of four hundred years of American history. 18th century brick buildings line the streets and reminders of its bygone beginnings can be found around each corner. As Maryland’s capital, Annapolis is home to the oldest State House still in use in the nation, the only state house that has also served as the nation’s capitol. The site of the ratification of the treaty that ended the Revolutionary War, the Maryland State House is a must see for history buffs. Today, besides its obvious connection to American history, its location on the Chesapeake Bay has defined Annapolis as a top port city today. Known for its maritime and nautical connections, Annapolis is a destination for sea-lovers. Home to the U.S. Naval Academy, guests of the city are welcome to tour the academy and walk among the strong brigade of midshipmen training to be officers of the Navy and Marine Corps. At the Naval Academy Museum, there are a myriad of artifacts and the famous Gallery of Ships. The proximity to the sea has permeated into everyday life in Annapolis. For those who cannot wait to get on the water themselves, there are plenty of opportunities for that as well. With cruises around the Annapolis Harbor, the opportunity to charter a boat for the day, go fishing, or explore the bay by canoe or kayak, there is something for all types of sea adventurers. For those who would rather keep their feet firmly on land and explore the shopping and culture opportunities of the city, Annapolis has many options there, especially in the Historic District. Along with hip boutiques, local, regional and national artists alike have their work in galleries and studios in Annapolis. Finally, Annapolis is a culinary gold mine. Try Sunday Brunch at Miss Shirley’s Café, an afternoon latte at City Dock Coffee, and a sweet treat at Annapolis Ice cream. Round out the night with Annapolis’s premiere seafood restaurant O’Leary’s or for those who would prefer the best Chesapeake inspired cuisine, stop by WEST Kitchen & Tavern. With something for every taste and budget, Annapolis is a unique Maryland city making the Bay not only a wonderful place to visit, but also to live. Just 30 miles southwest of Philadelphia, along the banks of Brandywine Creek, sits Chadds Ford Township, a quaint village dating back to pre-Revolutionary times with a range of attractive destinations. The award-winning Chaddsford Winery, the largest winery in Pennsylvania, is slowly but surely putting Pennsylvania on the map for American wine lovers. Founded in 1982 by Eric and Lee Miller, who learned the art of winemaking from their father at Benmarl Vineyards in New York, Chaddsford produces over 30,000 cases of wine annually. The winery hosts events and festivals for wine lovers all around the country. History buffs can take in the sights at the Brandywine Battlefield Historic Site, a 50-acre park protecting the location of the 1777 Battle of Brandywine during the American Revolution. The Chadds Ford Historical Society, a volunteer-staffed non-profit, maintains three pre-Revolutionary buildings which are open to the public. Stop in and tour John Chadds’s house and springhouse, which date back to 1725 and reflect the Chads’ Quaker heritage, and the Barns-Brinton House, built by blacksmith William Barnes in 1714. Chadds Ford is just a ten-minute drive to one of United States’ premier botanical gardens: Longwood Gardens. Longwood Gardens have 20 outdoor and 20 indoor gardens that feature fountains, exotic plans, and 11,000 different types of plants and trees. The Chadds Ford area was also the home of the great American artist and illustrator N.C. Wyeth, as well as son, the painter Andrew Wyeth, who founded the nearby Christian C. Sanderson Museum. Most of his collection is housed in the local Brandywine River Museum, owned by Wyeth family. Other attractions in the area include the Gilpin Homestead, a home dating back to 1754, and the William Painter farm, which was used as a station on the Underground Railroad. Head to Miami for a classically luxurious getaway within convenient travel distance. On the southern tip of Florida you truly get it all: the opportunity to experience laid-back island vibes and all the perks of a lively subtropical city without having to leave the country. Miami offers the perfect beach vacation, from pristine white shores and clear blue waters to beautiful resort amenities, golf, water sports, shopping and sightseeing. Depending on how you time your vacation, you may have the opportunity to take part in amazing events such as the internationally renowned Art Basel modern and contemporary art exhibit and Carnaval Miami, described as the “hottest street party in the nation”. Perennial classics that warrant a visit include the iconic Venetian Pool, the Miami Beach Botanical Garden, a walk through the art deco Ocean Drive and an outing to the Vizcaya Museum and Gardens. With numerous PGA National Golf Courses along with championship courses such as the Blue Monster at Trump National Doral and the Ocean and Rees Jones courses at The Breakers, avid players will be both pleased and challenged by Miami’s golf offerings. Notorious for its diverse and lively nightlife, Miami boasts a myriad of extravagant dining options to kick off the evening. Favorites include the upscale Japanese fare at Zuma, the modern and classic Palme d’Or, and the iconic, time-honored Joe’s Stone Crab, among countless others. However, dinner is just the beginning of your evening. Considering many come to Miami solely for the nightlife experience, the city certainly delivers any and all opulent late-night attractions one could imagine. Whether or not you have the pleasure of lodging at the hotels themselves, resorts such as the Fontainebleau, ONE Bal Harbour, the Mondrian South Beach, and the various Ritz-Carlton Miami locations offer a lavish night scene, including the renowned LIV and Sunset Lounge. Escape the District— and the cold— to Miami this winter. Most people know the Battle of Gettysburg as the turning point of the Civil War, where the bloodiest days of the conflict occurred. But while Gettysburg, Pennsylvania is known as a historical site, there is much more to it than that. Just 90 miles from Washington, DC in southern Pennsylvania’s Adams County, Gettysburg is an ideal destination for a weekend fall getaway. Gettysburg in October is an Autumn lover’s paradise. Besides being the home of National Apple Harvest Festival, the two weekends of October in Gettysburg feature antiques and classic car shows, pie-baking contests, pie eating contests, not to mention pony rides, petting zoos, and hayrides. Adams County has a lot to offer to nature loving visitors. Joining historic walking tours, scenic valley tours or a Gettysburg wine and trail might not only fulfill you visually but might satisfy you mentally too. If you are looking for something that is more active, I recommend you try one of Gettysburg’s several challenging golf courses. Of course, if you are a history buff, there is plenty for you in Gettysburg. You can take a Gettysburg Battlefield bus tour and go see Abraham Lincoln’s Place, where nationally renowned historian and Lincoln actor James Getty performs the 16th President’s famous Gettysburg Address. Or get a tour at Hall of Presidents and First Ladies, where wax figures portray the story of America. Gettysburg has a number of great American restaurants offering locally grown fresh fruits and vegetables, but you won’t want to miss the Fairfield Inn, where you can enjoy a Civil War era magic show while dining. As one of America’s oldest inns, Fairfield Inn offers a delightful memory if you are looking for an extraordinary experience while being surrounded by history. And even if you are there for just a meal, take advantage of the free tour of the historic mansion! With its charm and history, Gettysburg is a perfect destination for a fun weekend trip full of excitement and delightfulness. Free roaming horses, flawless beaches and a historic lighthouse—just three hours away from Washington, you can find all of these on Assateague Island. A thin strip of land stretching from Maryland into Virginia off the eastern coast of the Delmarva peninsula, Assateague Island is a glamorous natural beauty with incredible recreational activities. Protected from any kind of development, the entire island is a wildlife park, along with Chincoteague National Wildlife Refuge on nearby Chincoteague Island, accessible from Assateague by bridge. Besides being on the same island as beautiful pelicans flying, wild horses galloping and deer inhabiting the sand areas, there are a lot of other nature activities that are very appealing. Assateague Island beach is a true gem of the Atlantic Coastline. While during summertime it is a great place for seashell collecting, sunbathing, crabbing and wildlife viewing, it becomes a great attraction to many visitors later in the year as a place to enjoy the cool sea breezes and relax. It also is a great spot for surfing. Another adventurous activity that is entertaining for everyone is kayaking. Not only it is fun but it is also a great way to engage in the beautiful things that the nature of Assateague has to offer. 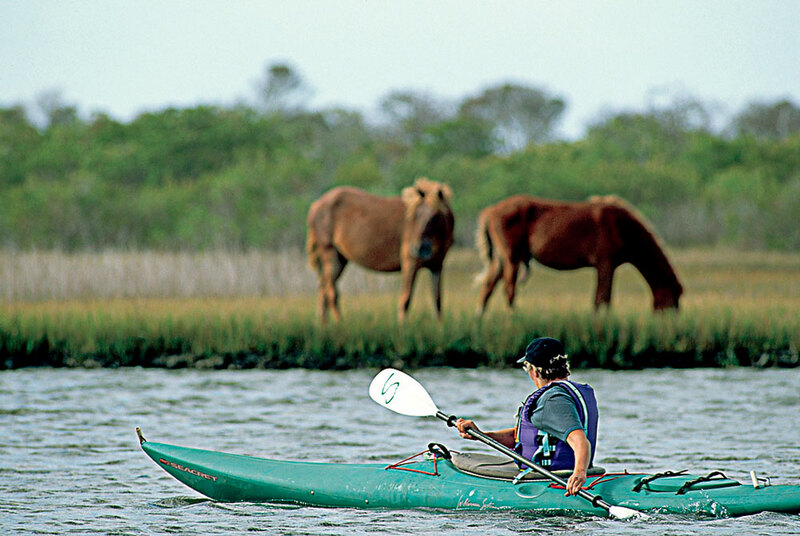 You will get to see the famous Assateague Lighthouse, paddle while enjoying a view of wild ponies, eagles and dolphins. Another option for exploring the hidden natural treasures in the island is wildlife cruises that leave from Chincoteague Island. In an island full of crab, clams and fish of course fishing is one of the most popular activities; however, it is only permitted outside the preserved areas in order to protect the pristine natural habitat. While you are enjoying what the island has to offer, you are also making sure you are not damaging anything in the environment, which gives a sense of connection with nature. With its bountiful natural beauty, Assateague is a great place for camping. You can enjoy a gorgeous view of the sea while overlooking to the Assateague lighthouse, or you can be camping by the woodlands, exploring the trails and bicycling around the island. Whichever activity you choose, Assateague Island is a great location to get away from the hustle of the city and reconnect with all the amazing things nature has to offer! Virginia Hunt Country is best known for its equestrian tradition, charming villages, spectacular estates, and picturesque farms. However, one of the most alluring perks of the region is the booming Virginia wine industry. This countryside is dotted with prestigious local vineyards that showcase local grapes and exclusive tastes. Two wineries, Chrysalis Vineyards and Boxwood Winery, speak to the native but luxurious feel of Virginia Hunt Country. Locksley Estate, home of Chrysalis Vineyards, is located in Middleburg, VA and offers 412 acres of what is widely recognized as some of the prettiest countryside in the world. Of particular interest to Chrysalis Vineyards is the native American grape, Norton, and the largest planting of this variety in the world can be seen at its vineyard in Middleburg. Recognized as the stand-alone North American variety for its unique ability to produce premium quality red wines, Norton was internationally recognized in the 1800s as the source of age-worthy and distinctively robust reds, offering complex overtones of spice, berry and pitted fruits. Today, the Norton is enjoying a resurgence of popularity, and a key element of the Chrysalis Vineyards’ program is to restore this grape to its position of prominence among the finest red wines of the world. In addition to celebrating this native Virginian gem, Chrysalis Vineyards has extensive plantings of Spanish and French varieties. Also, it has a large planting of the increasingly popular Viognier, Virginia's “signature white grape”. Offering relaxing and gorgeous views, Chrysalis Vineyards’ tasting rooms welcome all visitors with patio seating for 40, and its picnic pavilion sports Iron Works grills, which are open free to the public for cooking up hot fare on-site. Check out www.chrysaliswine.com for more information. You may recognize the name John Kent Cooke as former owner and president of the NFL Washington Redskins. Today, he is fulfilling his dream as proprietor of Boxwood Estate Winery in Middleburg, VA. Boxwood is committed to making premium red wines in the Bordeaux tradition with their own unique Virginia expression. From twenty-one sustainably farmed acres of red Bordeaux, the vineyard produces 2,500 cases of wine. Boxwood boasts the tightest vineyard planting on the east coast blanketing the slopes of this historic farm. Every vine and grape is treated with personal tenderness producing the elegant and complex wines. Boxwood Winery produces estate-grown red wine in four styles: Boxwood, Topiary, Trellis and Rosé. Each wine is produced with the five varieties of grapes certified by the French government: Cabernet Franc, Cabernet Sauvignon, Merlot, Petit Verdot and Malbec. All red wines, except for the Rosé, are barrel aged in French oak for 12 months, bottled, stored and sold at the winery’s tasting room. Visitors are welcomed Friday through Sunday from 11:00 am to 6:00pm. Boxwood Winery operates two wine bars in Reston and the National Harbor. The Tasting Room Wine Bar and Shops feature Boxwood Estate wines as well as wines from around the world. This taste of local luxury, with a pinch of French refinement, is reason enough to visit Virginia’s historic Hunt Country. Check out boxwoodwinery.com for more information. Photo Courtesy of: Kiawah Island Golf Resort. Many locals you meet in South Carolina will tell you they were raised on the water, and once you’ve visited that should come as no surprise. With resort communities and perennial beach towns sprinkled all along the coast, from the “Grand Strand” of northern beaches to Hilton Head Island, South Carolina is a beach destination with a longstanding habit of turning vacationers into residents. The nearly 3,000 miles of pristine coastline offers a wide variety of seaside spots within driving distance of most major east coast cities, and you’re sure to find one that fits the bill for your ideal beach getaway. If you are under the impression that one stretch of beach is no different from the next, South Carolina will likely change your mind. Each spot on the state’s shores, along with the surrounding community, has a distinct character you will notice right away. For those dreaming of a classically southern getaway, the handful of locally tried-and-true beaches located just outside of historic downtown Charleston will offer clean, family friendly private and public shores along with famed lowcountry culture and cuisine. Upon setting foot in the town of Folly Beach, a community steeped in a love of great waves, a variety of live music, and eclectic dive restaurants and bars, you are instantly absorbed into the pretense-free, laid-back surf town atmosphere. And if your goal is simply to strike the perfect, relaxing balance between swim, golf, shopping, and fine dining, the iconic Kiawah and Hilton Head Island resort lifestyles are unrivaled. With a seemingly endless summer, most years with temperatures still hitting the 80’s well into the fall months, South Carolina offers plenty of time to embrace the down-south coastal lifestyle complete with blue skies, golden sands, and life that moves a little bit slower. Escape the fast-paced and hectic lifestyle of DC this summer and treat yourself to a getaway in Rappahannock County. Just 65 miles west of the city, Rappahannock offers scenic outdoor adventures, historic towns, welcoming country accommodations, excellent local cuisine and wine tastings at some of the top artisanal wineries in Virginia. There is something for every taste, budget, and occasion. The beauty of Rappahannock and its surrounding area is incomparable. Rappahannock’s prime location nestled in the rolling hills of Blue Ridge, and conveniently located next to Shenandoah National Park and Skyline Drive, makes it the perfect spot for an outdoor retreat. Enjoy a scenic country drive or explore the natural beauty with a hike along the trails. After a full day taking advantage of the plethora of outdoor fun, enjoy a wide selection of exquisite dining options in the area. Rappahannock features farm-to-table gourmet restaurants that use organic meats and produce directly from local farms. In addition, Rappahannock is home to some of Virginia’s finest artisanal wineries offering wine tastings, and grape harvests at the local vineyards. The five-star and five-diamond Inn at Little Washington is a renowned hotel and restaurant with a fine dining experience that takes advantage of the county’s sustainable culinary practice reaching international acclaim. While in town, you cannot miss the abundant venues for arts and cultures. History, music, and art buffs will be in utter bliss in Rappahannock County. The area is filled with vibrant art studios, concert halls, and theaters with both world-class classical performances and family friendly events. It is home to the Castleton Festival, a popular opera and orchestra event in July held in its state-of-the-art performance venues. This summer will be its sixth season, featuring three symphonic concerts, theatrical readings, chamber music, song recitals, bluegrass, fireworks and more. Savor the cuisine, natural, and cultural flavors of one of the top escapes Virginia has to offer. Rejuvenate, relax and take advantage of the summer experience that Rappahannock has to offer. Photo Courtesy of The Inn at Canal Square in Lewes. The Delaware Beaches of Sussex County provide beautiful and relaxing summer vacation spots for many residents of Washington, D.C., Maryland, and Virginia. Known for their stunning sunsets, historic boardwalks, and unique tax-free shops, the Delaware Beaches have something to offer for people of all ages. Charming and family-friendly Bethany Beach is home to award-winning restaurants and hosts local Bandstand performances every Friday, Saturday, and Sunday from Memorial Day through Labor Day. Dewey Beach has one of the most lively nightlife scenes, with exciting local restaurants, live entertainment, and a great bar scene. For families, Dewey also has Monday Movie nights on the beach during the summer season. Rehoboth is known for its bustling boardwalk, which includes attractions such as Funland, the iconic Grotto’s Pizza, and miniature golf. The Delaware beaches host a variety of events each summer. Bethany hosts a unique Seaside Craft Show and there is Downtown Rehoboth’s Restaurant Week. Rehoboth Beach VegFest takes place on during the summer and celebrates healthy living and lifestyle choices. The annual Firefly Festival takes place this year on in Dover, DE, and boasts a star-studded lineup. If you want to explore different areas of Delaware in a fun, new way, try a tour of the Delaware Wine and Ale Trail. The trail features thirteen different wineries and breweries throughout Delaware. You can even download a passport at the beginning to keep track of where you have visited throughout the tour. If you visit at least 8 locations, you can send your passport to the Delaware Tourism Office to receive a limited edition wine glass or mug.